While many people look at it as a game, foosball is as much a sport as anything else, and the Foosball World Cup serves to prove that. 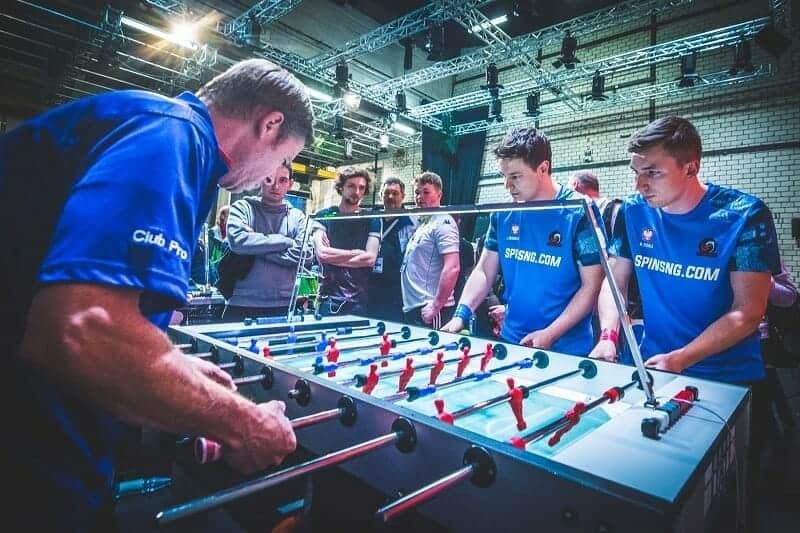 There are a few different competitions that can be classified as the world championship for foosball, so we’ll take a look at each one of them in turn. First off, let’s take a look at how competitive foosball tends to work, as there are many ways to go about it. We’ll also go over some of the more prevalent shot types that you will see used by the world’s best foosball players, and we will compare the number of winners and the shots they used. While you can arguably classify any game of foosball as “competitive,” actual competitive foosball consists of organized events, much in the same vein as sports. 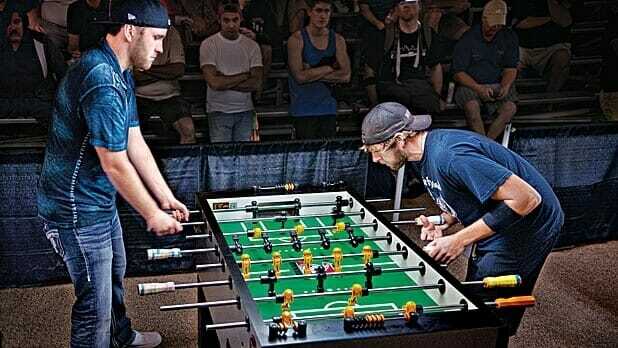 Foosball is taken just as seriously as any other sport at the higher levels, and some tournaments can offer a substantial purse for the winner. Competitive foosball has long been popular, and it is by no means a fairly recent invention, though its popularity is always steadily growing as more and more athletes get into it. Foosball championships tend to be hosted all around the world, as the game’s popularity is rather widespread. Competitive foosball can be played in either a singles or doubles format, though singles events are more common. Only the most reputable and long-standing table manufacturers have their tables used in competitive settings, and there is a championship for each type of table. The four most common tables that are used in competitive matches are the following: Tornado, Leonhart, Garlando, and Bonzini. There are typically three singles championships every year, one for each of the tables from these makers. This wide range of tables means that players accustomed to various table types will have equal chances. Since 2012, the World Championships have allowed up to two rotations of the players over 360 degrees after a shot before it results in a penalty. This has permitted for harder shots that require more skill and precision when it comes to control, adding yet another technical element to gameplay. The first competitive event that we will be looking at is the World Cup, a game that is reminiscent of the FIFA World Cup for soccer. In this event, some competitors represent their home countries looking to take home the title and prove that their nation is the best at foosball. Unlike in soccer, these World Cups occur once a year, though the foosball World Cups that take place in the same year as FIFA World Cups tend to be a little more celebrated. The World Cup is organized by the ITSF (International Table Soccer Federation), and there is often a decent prize up for grabs. The World Championship of Foosball is a separate event from the World Cup, and it is held on three different types of tables for a total of three World Championships a year. The tables used are from Leonhart, Garlando, and Bonzini, and there are both singles and doubles championships. 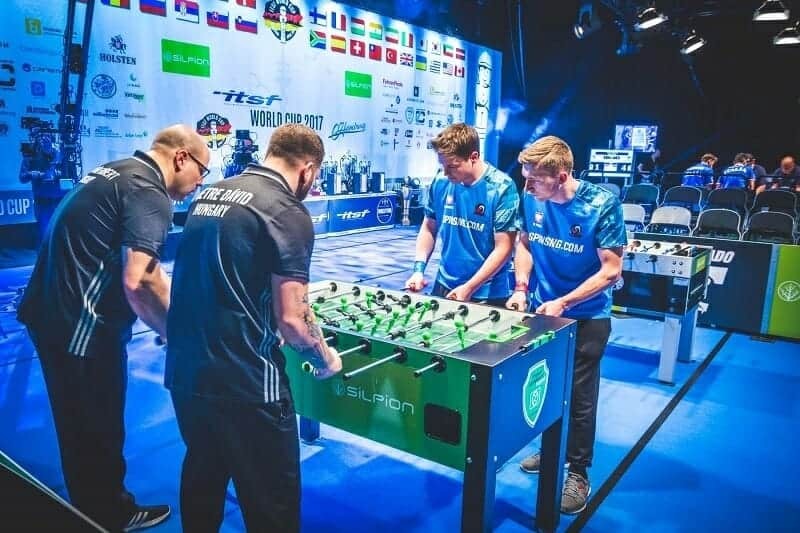 Since 2015, the doubles World Championships of Foosball are only hosted once every three years, while the singles Championships are still held three times per year. Doubles world championships often feature a mixed table format, since it would be inconvenient to rehost them for different tables. Last but not least, there is a World Championship that is hosted exclusively on Tornado tables. This Championship is often hosted in the USA, and it has been for the past three years. The tournament features a men’s singles format, and it is often a highly competitive affair. Tornado tables are viewed as some of the best competitive tables in the world, but the competition is mostly an American affair. However, there have been foreign winners of this championship. The most recent non-American winner of the Tornado Championship was Frédéric Collignon in 2012. There are a few different competitions, so going over the world champions is not quite a straightforward affair. Let’s start off with the Tornado Championship. For the past three years, the competition has been won by an American, Tony Spredeman, who also won in Dallas, back in 2013. The last mixed doubles competition was hosted in 2015, the year when the competition was announced to take place every three years instead of annually. The Austrian duo of Ollie Pett and Kevin Hundstorfer took the title in Torino that year, and they made exquisite use of the snake shot technique. In 2016, there were three world champions, one for each of the tables used in the competitions. For the Leonhart table, the winner was Felix Droese in Sankt Wendel, Germany. The Garlando Competition in Salzburg, Austria went to native Kevin Hundstorfer, and the Bonzini Title went to Joaquim Pinheiro of Portugal in St Quentin, France. As you can see, keeping up with all of the champions in the Foosball world can turn into a bit of a chore when you consider the sheer variety of titles that are available. Most of the time, fans focus on a Championship using their preferred table type, though there are die hard fans who follow every competition. Making it to the level of foosball world champion requires an immense level of skill, but it can be accomplished. If you feel like you have the potential to be amongst these names, then keep trying until you can represent your country at the highest level for this sport. We hope that we have been able to provide all of the necessary information when it comes to foosball championships and world cups. We understand that the info can be relatively challenging to come across, but it is out there. Thank you for taking the time to read, and feel free to comment down below.